This friendly apartment complex is located in the middle of a well-tended garden area, directly next to a cliff with wonderful views over the coastline. The beach is easily reached down a path and a flight of steps, around m away. Various shops, restaurants..
General Description: Alfagar Aldeamento Turistico is located 150 m from the sandy beach. The closest cities to the hotel are Vilamoura (10 km) and Albufeira (5 km). To make your stay more comfortable a lobby, a kiosk and a reception are available. The.. Guests can also use the facilities at the Alfagar Suites Hotel next door.100m from the steps to the beach in Santa Eulalia area and 5km to Albufeira‘s atmospheric old town. 2km to the lively nightlife in the new town.Children's section of pool ;PlaygroundOne.. The Alfagar I is located 200 m from Oura Beach, 5,5 km from the centre of Albufeira and 10 km from Vilamoura. The complex amenities include a swimming pool, children s pool, restaurant, bar and safety box at the reception (extra charge).The apartments.. The Alfagar I Apartments are situated in the town of Albufeira, in the Algarve region of southern Portugal, which can accommodate families and couples who are visiting the area. The hotel is near to many of the local areas destination and points of interest,.. The Algarve Gardens Apartments are located in a delightful area in Albufeira, the heart of the Algarve, steps from the beach at Praia da Falesia in Portugal's most southern province. Elegant and traditional, this property features 92 bungalows and 86 studios.. The Alfamar Villas ¿ Algarve Gardens Apartments are set in the natural surroundings of a pine forest, with a large expanse of gardens and sports fields. This is a good choice for those looking to be active while on holiday, with extensive sport facilities,.. The Alfamar Villas ¿ Algarve Gardens Apartments is a series of apartment blocks and low rise buildings set within extensive gardens in the lively resort of Albufeira. 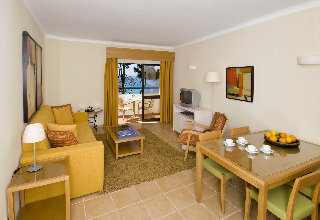 The accommodation consists of rooms and apartments with one or two bedrooms. The..
General Description: Algamar is located 2 km from the sandy beach. The closest cities to the hotel are Quateira (2 km), Albufeira (20 km) and Faro (25 km). To make your stay more comfortable a reception is available. For guests who wish to be mobile,..
General Description: Algar in Armacao de Pera has 47 rooms, spread over 7 floors. The hotel is located in front of the sandy beach. The closest cities to the hotel are Silves (13 km), Portimao (18 km) and Lagoa (13 km). To make your stay more comfortable..